hey guys, so I get asked this question a lot. 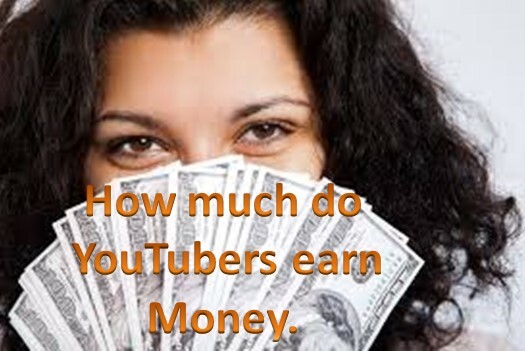 because most people don't know how Much do YouTubers Earn or if YouTubers actually get paid. so I'm going to give my answer to this question. the short answer is that YouTuber Earn through advertising revenue. This means advertisers pay YouTube to run their ads before ordering your videos, and YouTube, in turn, pays you for bringing viewers to those ads. your video needs to be monetized in order for ads to play before it and enabling monetization is as easy as agreeing to some terms and then checking a little box that says "monetize this video". you get paid for every monetized view. so YouTubers do not get paid based on how many subscribers they have, how many likes they get.. it's all about the views. A YouTuber could have 10 million subscribers but it could still be making less money than a YouTuber that has only 10 subscribers if that YouTuber is somehow getting more views. This change is based on many, many factors, such as how many minutes watched per view, what month it is, and how many of the views used Adblock. means for every 1,485 views, I got a dollar. or for each view, I get about 1/15th of a cent. and that number changes drastically throughout the year. for example, December is typically the best month for YouTubers since it is the Christmas season and everyone's home for winter break, and more people watch videos, but also advertisers usually want to use up the rest of their budget before the end of the year. I've seen numbers as low as 550 views per dollar. but as soon as the New Year hits, earnings dropped to a 1/3rd of what it was the day before. which is how much the advertiser pays per 1,000 AD views, but not only am I very ignorant about those things I feel that directly dividing my views by my earnings may provide a measurement that's easier to grasp. So one thing that's actually hurting YouTubers and causing them to receive less per view is Adblock. if the ad doesn't get watched, we don't get paid. so YouTube's answer to Adblock is YouTube's red, which directly supplements every YouTuber with an additional stream of revenue. so I hope that clears up some confusion and that you learn something. how much do youtubers earn do you get paid per view YouTubers actually get paid.